(Health.com) -- Women who develop a mild case of gestational diabetes during pregnancy tend to have fewer complications and healthier babies if the diabetes is treated, according to the first large-scale randomized trial in the U.S. to address whether such treatment leads to health benefits for mother and child. 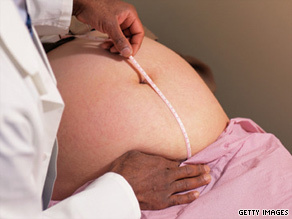 Exactly when women should be treated for gestational diabetes is still unclear, experts say. As many as 14 percent of pregnant women in the U.S., or about 200,000 women annually, develop gestational diabetes. This pregnancy-related diabetes can cause the fetus to grow too rapidly, and the excess weight can make delivery difficult and lead to complications. What's more, gestational diabetes increases the risk of fetal death and preeclampsia, a potentially life-threatening rise in blood pressure in the mother. However, the benefits of treating gestational diabetes are somewhat controversial; although most obstetricians screen and treat pregnant women for blood-sugar abnormalities, the 2008 guidelines of the U.S. Preventive Services Task Force has said there is not enough strong evidence for or against screening and treating gestational diabetes. Gestational diabetes can be treated with dietary restrictions, the oral drug metformin, or insulin injections. Landon says that unfortunately, some women diagnosed with the condition are not even given a real meal plan to follow; instead they are simply advised to watch their sugar intake. The new research, a partnership of 14 different institutions, showed that women were half as likely to have larger-than-normal babies if they were treated. For example, 14 percent of women who weren't treated had a baby that weighed more than 8 pounds, 13 ounces, compared with only 6 percent who were treated. The newborns also had fewer cases of shoulder dystocia (1.5 percent with treatment vs. 4 percent without treatment), a potential emergency in which the birthing process stalls due to entrapment of the infant's shoulders--a problem that's more likely if a newborn is larger-than-normal. Women who were treated had fewer cases of high blood pressure or preeclampsia (8.6 percent vs. 13.6 percent) and were less likely to need a Caesarean section (about 27 percent vs. 33.8 percent) than women who were not. "Gestational diabetes has been somewhat of an enigma for the last four decades because the benefits of treating it were not substantiated by strong evidence," explains Sacks, who wrote an editorial that was published with the study. "Now we know that it's a treatable disease and that's supported by solid science." Health.com: Am I eating my way to gestational diabetes? Although treatment regimens are fairly well-established, Sacks says that exactly when women should be treated for gestational diabetes is still unclear. Whereas the current study used a fasting-glucose-test threshold of less than 95 milligrams per deciliter in women with an abnormal oral glucose tolerance test, another large-scale randomized trial published in 2005 by Australian researchers showed similar benefits using a much higher threshold of 140 milligrams per deciliter. "A uniform definition of gestational diabetes mellitus is necessary to make valid comparisons of the results of intervention trials," writes Sacks. According to Landon, new criteria for the testing and treatment of gestational diabetes are being considered and may eventually lead to more women being treated for the condition. Health.com: Diabetes -- More than just a sugar overload? Most women in the U.S. are screened for gestational diabetes between 24 to 28 weeks of pregnancy but may be tested even earlier if they are very obese, have a strong family history of the condition, or if they had gestational diabetes or gave birth to a large baby during previous pregnancies. If a one-hour oral glucose test is positive for elevated blood sugar, then women generally undergo a similar three-hour test in order to be diagnosed. Although gestational diabetes usually goes away after a woman gives birth, women who have the condition are 50 percent more likely to develop type 2 diabetes within the next 20 years. For that reason, the American Diabetes Association recommends occasional blood-sugar testing, a healthy diet, and regular exercise even after childbirth.